I’m so proud to publish part VIII of this ongoing monthly series where 5 different travelers share a moment during their adventures that helped them restore their faith in humanity. This just shows how much kindness exists out there in a world where everything seems so fast-paced and people are always busy doing their own thing. I hope these stories inspire you to lend anyone – even a stranger – a helping hand in times of need. It can be a small act of kindness like buying them lunch, or something even more generous like letting them crash on your couch for the night. In any case, a little often goes a long way! It was our first day in Kuala Lumpur, Malaysia and we were trying to navigate to our hotel from the airport. We took a 45-minute bus ride to the main station in the city center and from there we had to hop on the tram another few stops. After standing in line at the ticket machine for 20 minutes, we were pleasantly surprised to find the ticket machine was in English. We collected our token, swiped and entered through the turnstile, and hopped on the tram. We were pretty satisfied with our navigational skills at that point and how smoothly things were going. We were almost to the hotel where we could relieve our shoulders of the weight bearing down on them. We exited the tram and inserted the tokens at the gate to exit through the turnstile. Brittany exited with no problem; however, Charlie was not able to exit. It took his token but did not release the turnstile. He frantically looked around for another exit or for a staff member as swarms of people pushed past him to exit but there were none to be found. As we both stood there for a minute thinking “now what do we do?” a young Malaysian couple exited through the turnstile next to us. We caught their eye and as they walked ahead they looked back, obviously noting we were having problems. The boy then walked back and handed us a token and smiled at us. He couldn’t have been but a teenager, and although it may seem like a small gesture to some, we were overwhelmed with gratitude. The first day in a new country is always a bit stressful and this was a wonderful way to be welcomed to Malaysia. This was the first of many ways that Malaysians showed us such incredible generosity and hospitality during our stay. Brittany and Charlie traded the 9 to 5 and the “American dream” in pursuit of a location independent lifestyle. They blog about their expat life in Thailand, how they fund their lifestyle and their travels around the world at TheTradingTravelers.com. The time I showed up to bush camp and arrived with nothing. I had been on an overland tour from Cape Town to Zanzibar when our group was bush camping in Chobe National Park, Botswana. We arrived at the camp where the truck we were traveling on would be staying at and then hopped on a safari truck that we’d be in for the remainder of the day. The truck would then drop us off at our bush camp. We’d been told to leave our bags that we planned to bring to bush camp with us on a tarp that would be picked up later and dropped at our bush camp. Well, after our safari and arriving at camp, my bag was nowhere to be found. The only thing I had that made it was the tent. I assumed that the bag had been forgotten or it misplaced. Since I’m from a much colder climate than Botswana I figured I’d survive a night without a sleeping bag, pillow or clothes. Until the weather started to get really old. I decided not to complain as not to bother the rest of the group. Once everyone saw that I didn’t have my backpack and was still out in the weather with just a raincoat and shorts, everyone started handing things to me: extra shirts, pants, socks, our guide even gave me an extra blanket. Some of the people I’d been traveling with for a good 3 weeks by that point, while others I had just met a couple days prior. It’s just nice to know that people you have just recently met actually care. Everyone was very adamant that I wouldn’t go to bed cold that night. Born and raised in Eagle River, Alaska, Nicole had always known that she wanted to travel. She became a dental hygienist after finding out about its flexible schedule and has been traveling off and on ever since. 50 countries later, Nicole decided to start a travel blog, and next May she leaves for a year long RTW trip. Read more about the Adventures of Lil Nicki in Botswana on her blog, alongside more stories and adventures here. During my time in Vietnam I was scammed more than I ever thought possible. Arriving at Saigon airport to take my flight to Da Nang I approached the desk to query why my flight wasn’t on the board. It had been rescheduled. I sighed relief and asked when to, ‘Five hours ago’ was the reply. A few frustrated tears later and an unexpected flight expense I arrived into Hoi An later than expected. With dogs barking at me and in total darkness I found my way down the long mud road that led to my home stay for the night ready to rest up. The chain across the gate quickly let me know I was locked out for the night. Pretty close to giving up and flying home a ruffle of curtains revealed some light a few doors down. An old gentleman, with very little English came to his window, squinted at me in a concerned way and ushered me over. Within a few minutes a warm cup of tea was in my hand as I sat on his porch making small talk to his beaming wife who made me feel a sense of home I was in such desperate need for. He called and awoke the home stay owner and made sure I could access my bed for the night. A simple gesture which turned around my whole experience of one country and a moment I’ll cherish when I think back to my time in Vietnam. Dan has been travelling the world solo for many years, curious to explore local cultures and be shaped by the people he meets on the journeys. He loves diving underwater, dodgy street food and getting under the skin of any destination. You can read all about his travels here. Owner of travel blog, She-Writa. Ometepe. Two glorious volcanoes rose from daunting Lake Nicaragua as our listing ferry was willed to shore by eager passengers. 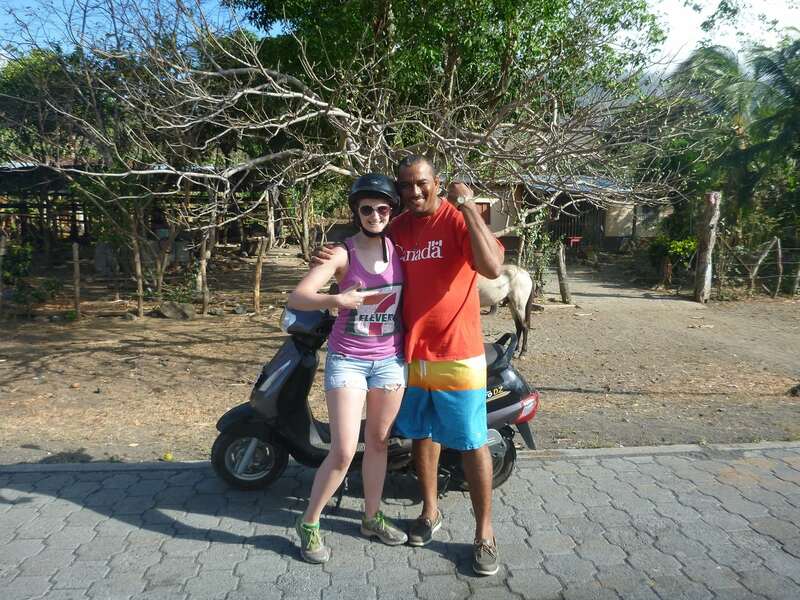 Carolyn and I were beyond excited to secure scoot rentals and explore the island. First stop? Los Ramos. Laura was less than enthused. Her confidence on two wheels had yet to flourish; arguably set back by a fender bender with a parked scooter before we even signed the papers. By the end of day three Laura had barely exceeded 20km per hour, never left pavement and refused to ride into Los Ramos due to the rocky grade leading to this charming village. Carolyn and I teased her… relentlessly. That night, she finally did it. And the next morning we packed up from Los Ramos endeavoring to reach town and have breakfast before catching the early ferry. Karma had other plans. Somewhere near a random farm in the middle of nowhere Laura’s trusty scooter went flat. Three people, 55L packs and two remaining scooters… the math of the situation added to failure in the scorching Nicaraguan sun. Somehow, we managed. Just barely. Setting off precariously for the rental shop two towns away. Our minds raced… time pressure… financial pressure… tire pressure. Hopefully they’d take it easy on us. We passed through the first town pausing briefly to look for anything that might resemble a mechanic or… or superman. I saw a row of bikes and in my best Spanglish conveyed that we needed assistance with a flat tire. Then, all of a sudden a man walked through the door wearing a bright red Canada shirt and rocking the brightest smile we could have seen in that moment. Superman came to us by way of a rare English speaking Nicaraguan named Reggie from Big Corn. He sought out a pump, hopped on his motorbike and followed us out into the country to rescue trusty. He repaired the tire and never asked for anything in return. We could not believe it. Should he ever read this – Thank you again Reggie. Our Nicaraguan Superman. Your unconditional willingness to help was and is, inspiring. MJ is a generalist with a passion for travel, fitness and health. She perpetually strives to be greater than the sum of her parts finding inspiration from people everywhere. Read all about her travels here. Chance meetings and random invitations often make the best and most memorable travel experiences. One that tops them all is when my boyfriend and I took a leap of faith and accepted an invitation from a stranger to attend his first wedding anniversary party in his humble village home in rural India giving us a fascinating glimpse into traditional Indian village life and the chance to met the most genuine and hospitable people ever. 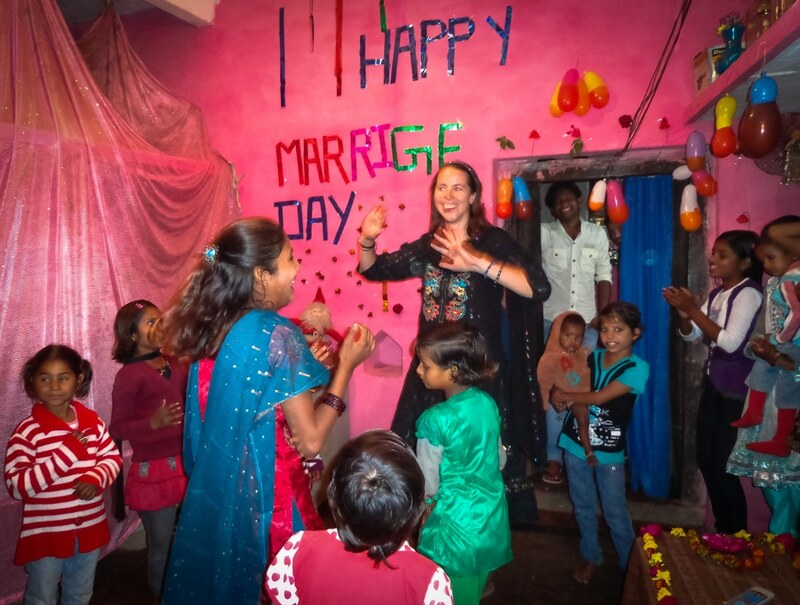 Bollywood music was cranked up full blast as the party got started and the night erupted into a riot of colour and laughter, the whole family whooped, cheered and leaped around, dancing so whole heartedly and full of unrestrained love, joy and exuberance. The girls dragged me up to teach me their elaborate moves and routines taken from Bollywood movies. As the ladies danced in a swirl of brightly coloured shimmering saris in shades of yellow, orange, pink and lime green and the little kids jiggled around giggling and smiling I tried my best to master the dances. I think my awkward dancing was of much amusement but still I was treated like a guest of honour. I must have looked ridiculous but I had the time of my life. The language barrier and the loud volume of the music makes it hard to talk but smiles are a universal language. I was amazed and humbled by the warmth, love and generosity that this family showed to me, a stranger. They don’t have much at all, but what they do have they share so generously and so whole heartedly. I felt so honoured to have been invited into their lives, to be able to share this wonderful celebration. I found it somewhat awe inspiring to witness the love that they all had for each other and the joy they found in their simple way of living. It’s hard to describe just how special this random moment of friendship was but it’s still my all time travel highlight. The feeling of celebration, joy, love and family unity was incredibly touching and contagious. It’s a priceless experience that I will never forget and hope to learn from. 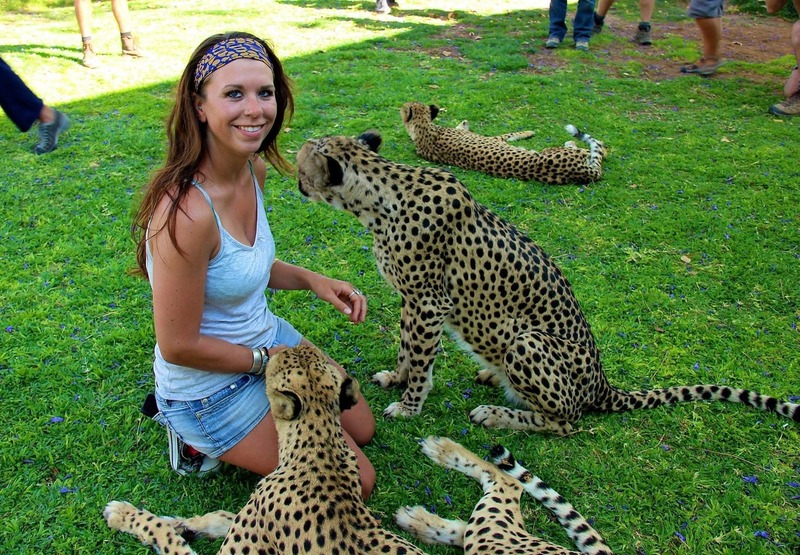 Anna Phipps is a nomad and travel blogger who quit her life in the UK in Dec 2012 to travel slowly, independently and on a budget around India, Southeast Asia and Australia. She shares her passion for India and for budget travel on her website here, to show others how they too can make their dreams of travel a reality.